First Loop 202 South Mountain Freeway Bridge Opens to Traffic in Lavine, Ariz. Following a five-month closure of the Elliot Road and 59th Avenue intersection, crews have completed a bridge that allows Elliot Road traffic to safely travel over the South Mountain Freeway mainline, which will open to traffic by late 2019. 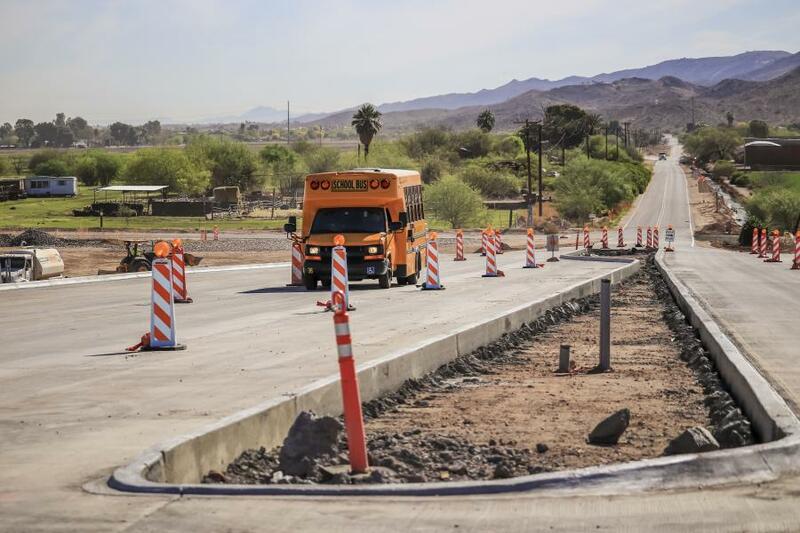 Drivers in Laveen, Ariz., are now using the first bridge completed for the South Mountain Freeway, marking a milestone for the Arizona Department of Transportation's Loop 202 South Mountain Freeway project. The extended closure, which required motorists to detour to Dobbins Road between 59th and 75th avenues, allowed crews to accelerate construction on one of the 13 interchanges for the South Mountain Freeway. It also is one of 40 bridges planned for the 22-mi.-long freeway corridor. constructing a 272-ft., two-span bridge. Additional work needed to complete the interchange will include paving the ramps and mainline freeway, signage, lighting, final striping, signals and landscaping.